East Catholic High School’s Joe Reilly looks for an open teammate around Windsor High School’s Jordan Riley during the Central Connecticut Conference boys basketball tournament final at Bulkeley High School in Hartford on Thursday night, Feb. 28, 2019. Windsor won 87-85. 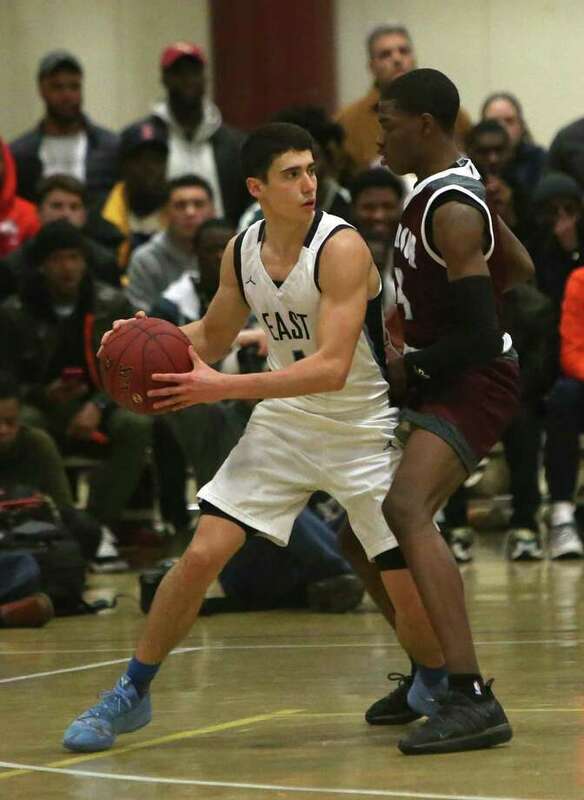 HARTFORD — Calling it a tale of two halves in Thursday’s Central Connecticut Conference basketball final showdown would be selling both Windsor and East Catholic both short. The two league powerhouses traded jabs and body blows. Windsor dominated the first half, East Catholic the second. East Catholic almost came all the way back from 23 points down in the third quarter. The Eagles were down as few as 1 and were within a basket to tie or take the lead several more times. But the second-seeded and sixth-ranked Warriors hung to defeat previously-unbeaten and top seed East Catholic 87-85 before a sellout crowd of 1,500 at the Babe Allen Fieldhouse. “We can always shoot it well, but the deal is to play good defense,” Windsor coach Ken Smith said. Windsor junior guard Amir Spears lit up the Eagles for 41 points, including two huge pullup jumpers late in the game to keep East Catholic (23-1) behind. He also said Windsor’s blowout home loss to East Catholic in the final week of the regular season ultimately spurred the Warriors to this tournament title. Spears scored the last eight for the Warriors (21-3), who have now beaten East Catholic twice over the last two seasons — both times at Bulkeley. The last one was in double-overtime at the buzzer in the Division I state tournament quarterfinals. “I didn’t get to play last year, so this is big for me, personally,” said Spears, who transferred in from Northwest Catholic. But it was three plays in the final 2.7 seconds that East Catholic coach Luke Reilly questioned. The first was when Jaylin Hunter (29 points) was fouled in the corner. The officials determined it was a 1-and-1 situation, not three free throws. Hunter made the first free throw but missed the second one intentionally. The ball went out of bounds, the buzzer sounded and Windsor began to celebrate and some fans poured onto the court. The officials huddled and determined there were .9 seconds left. And, on the game’s final play, Joey Reilly, who scored 13 of his 23 points in the final quarter, came off a screen to the same corner where Hunter was fouled, but the buzzer sounded before he could get a shot off. “The last play, there was also contact and I’ve never seen in a championship game where the clock is not equipped to put .9 seconds on,” Reilly said. “So the instruction was to have the scorekeeper count in his head and then hit the button and he hit the button before the ball even got inbounds. Jordan Riley added 23 points for the Warriors, who snapped East Catholic’s string of consecutive CCC titles at three. The two teams can only meet again in the Division I state final at the Mohegan Sun. Windsor shot 11 of 18 in the second quarter to establish a 51-29 halftime lead. “We played incredible defense against one of the best teams in the state,” Spears said. Corey McKeithan 6 1 1-2 16, Amir Spears 5 6 13-18 41, Jordan Riley 5 4 1-1 23, Lawrence Foreman 2 1-3 5, Shomar Leapahart 1 0-0 2 Blake Ooloji 0 0-2 0. Totals 19 11 16-26 87. Joey Reilly 6 3 2-2 23, Jaylin Hunter 4 5 6-8 29, Matt Knowling 8 5-5 21, Matt Byman 3 0-0 6, Sam Walch 0 0-0 0, Chris Jones 1 1 1-3 6. Totals 22 9 14-18 85. 3-point goals: W–Spears 6, Reily 4, McKeithan; EC–Hunter 5, Reilly 3, Jones.